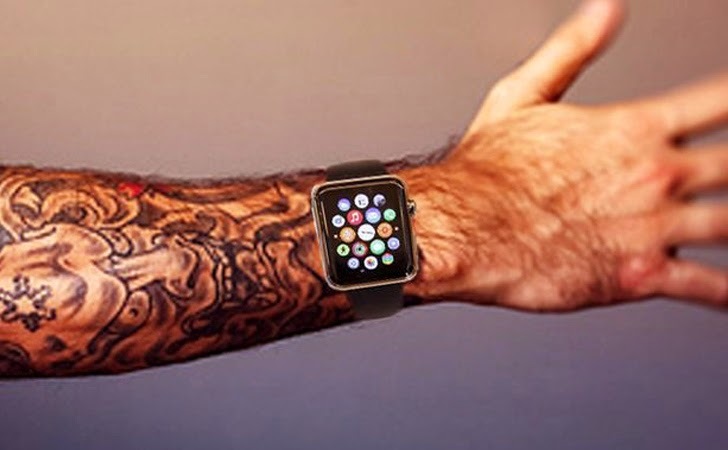 If you love wearing tattoos and have one on your wrist, then the Apple Watch won’t work for you. Yes, you heard that right. Apple watch is unable to figure out your blood pressure or even sense your skin contact if you wear the watch on a tattooed wrist. Generally, the Apple Watch automatically detects your wrist by your measuring your heart's pulse rate. So, you don't need to enter a password every time you put the watch on your wrist. However, the infrared sensors of the Apple Watch that enable wrist detection often fail when encountered by dark ink tattoos or scars. Many users on Twitter and Reddit have complained online that their Apple watches doesn’t play nice when worn on a tattooed wrist. The watch's heart rate sensor loses the connection and gives inaccurate readings, even the device fails to detect direct contact with the user's skin, causing apps to shut down and repeatedly ask for the device passcode. Michael Lovell noticed the issue on the Apple watch and provided a proof-of-concept video on YouTube illustrating the problem. When he wore the watch on his right wrist, the watch stops working and asks for a passcode. However, after being transferred to his left wrist, the device starts working fine. A Reddit user with online moniker Guinne55fan also encountered the same issue. "When I decided to try holding [the Apple watch] against my [non-tattooed] hand...and it worked," Guinne55fan wrote. "Once I put [the watch] back on the [tattooed area] with black ink the watch would automatically lock again." Basically, the wrist detection feature of the Apple Watch relies on a technique called photoplethysmography. This long word actually means that the heart rate sensors flashes a combination of visible and infrared light at your skin and calculates the return. The blood flowing through your wrist at any given moment lets the sensor of the watch works out your heart rate. However, the dark ink of the tattoo on the skin is troubling the sensors of the watch as the ink absorbs the infrared light used by the sensor, supposedly stopping the device from working. There is a workaround. If you have a dark ink tattoo on your wrist and facing the same issue, you can switch off the "Wrist Detection" feature so that it prevent the device from asking for a passcode again and again. Though, the solution is not at all perfect for Apple watch’s user as it makes your device less secure and switches off Apple Pay, as well. However, the simplest solution is to wear your Apple watch on your other wrist if it is not tattooed and, of course if you feel comfortable. You can also just wait for a fix to be issued by the company.